The Virginia Commercial Fertilizer Law requires distributors of regulated products, such as commercial fertilizers, specialty fertilizers, soil amendments, and horticultural growing media, to submit statistical tonnage reports, inspection fee reports, and a payment for inspection fees. Enforced by the Virginia Department of Agriculture and Consumer Services (VDACS), the law requires that any person intending to distribute regulated product first obtain a license. However, the paper processes required for users to gain the approval needed for using fertilizer and other regulated products has become unnecessarily messy for VDACS. 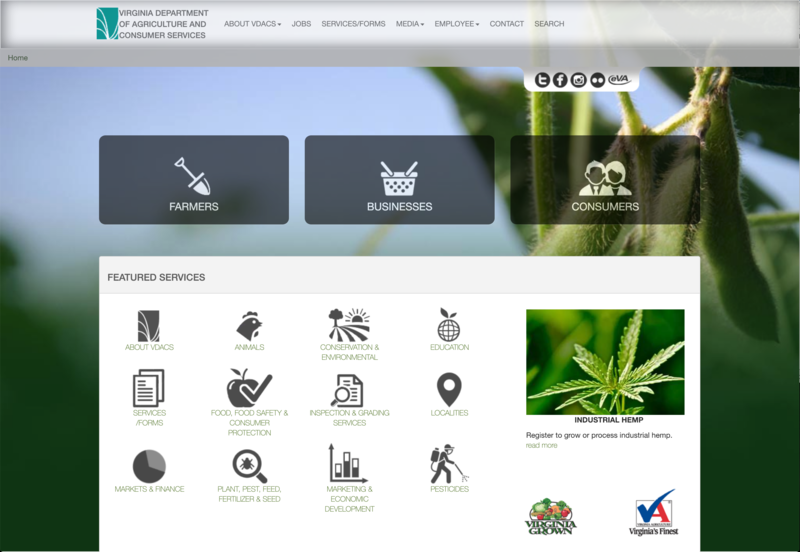 Having successfully engaged Virginia Interactive (VI) for a full overhaul of their website, which went on to win numerous website, media, and creative awards, VDACS again brought on VI to develop a clean solution for online payments related to the Virginia Commercial Fertilizer Law. Fees for fertilizer application are assessed based on tonnage. For all users, a minimum payment of $35 is required regardless of usage. With VI's solution, the required statistical tonnage data and inspection fee payments can be submitted online for the first time. With more and more users shifting to mobile devices for their internet use, mobile responsiveness was of paramount importance. To achieve this objective, VI took a "mobile-first" path to completing the project, ensuring that the application could be used on any smartphone, tablet, or laptop. The solution has given immediate gains for VDACS, allowing allocation of resources to more pertinent tasks related to the organization's mission serving the Commonwealth. The simplified process created for the fertilizer reporting and payment program is simple, tablet-responsive, and cuts down on errors associated with paper processes. Thanks to breaking new ground with Virginia Interactive, VDACS and its users throughout the Commonwealth are reaping new gains in simplicity, efficiency, and service.